Every year I see these M&Ms around Halloween, and don’t do anything about them. But this year I decided do something about them. And by that, I mean baked into soft, buttery blondies. 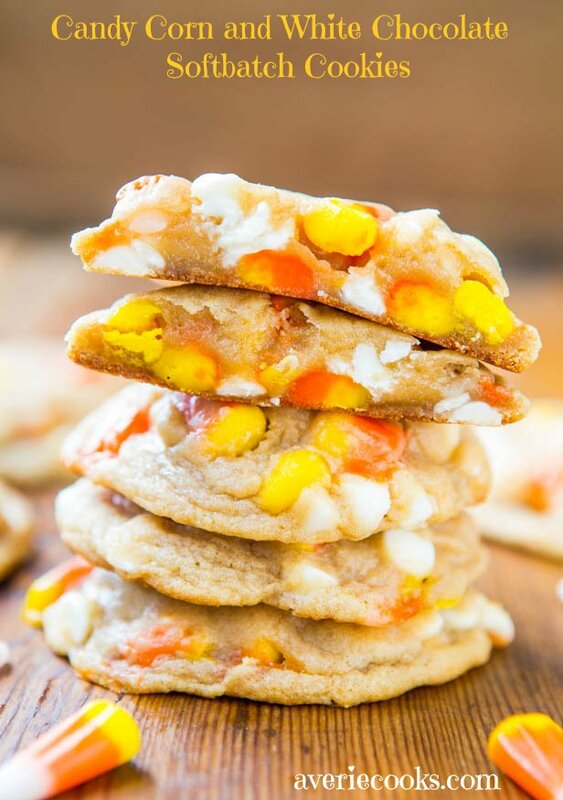 When I made the Candy Corn and White Chocolate Softbatch Cookies, many people asked if I had tried the M&Ms Candy Corn White Chocolate Candies and yes, I sure had. To me they hardly taste like candy corn, and are basically white chocolate M&Ms. I love white chocolate so that’s great, but was hoping for more candy corn flavor, but I don’t get much. I think the orange, yellow, and white colors are why they’re named ‘candy corn’ M&Ms, not because of taste. I bought the M&Ms at Target and they’re seasonally available at Target, Wal-Mart, many grocery stores, and Amazon. If you can’t find them in your area, white chocolate chips will duplicate the flavor most closely. Or use regular M&Ms, Reese’s Pieces, mini Rolos, or your favorite diced candy bar. Actual candy corn could probably be used, but make sure it’s not touching the bottom of the pan and is well-shielded by batter or it’ll melt and then stick fiercely to the pan. Same principle as discussed in the Candy Corn and White Chocolate Softbatch Cookies post. I used my trusty blondie recipe because it’s no-hassle , no-fuss, no mixer required, one-bowl, and goes from pantry to oven in 5 minutes. And they’re ready in under 30 minutes. Scroll down to the related recipes to see just how many times and ways I relayed and parlayed the recipe. It’s the simplest batter ever to make, and it’s very easy to memorize because everything is a ‘one’. Melt 1 stick of butter in the micro, whisk in 1 egg, 1 cup of brown sugar, 1 tablespoon vanilla. Then stir in 1 cup of flour and 1 cup of M&Ms. Done. 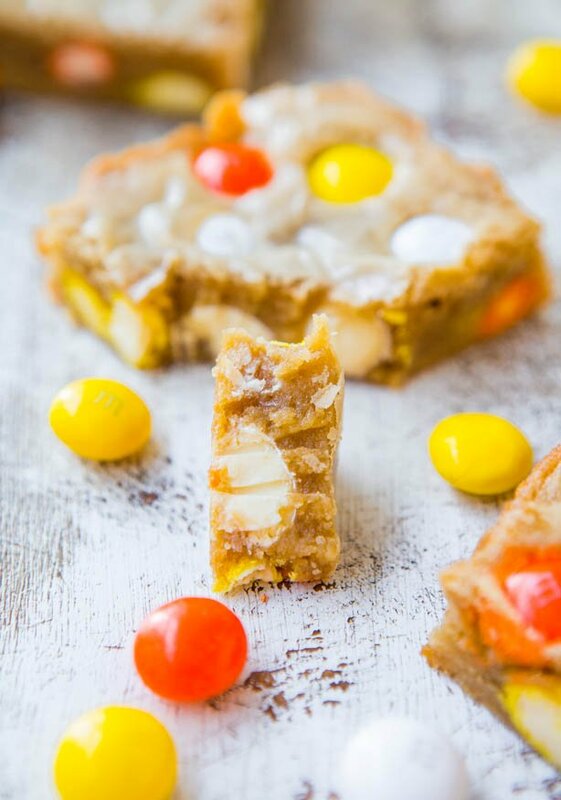 After turning the batter out into the pan, I strategically placed the remainder of the M&Ms from the bag on top of the batter to create a nice visual pop of color and exposed candy. Little tricks like that really make your baked goods shine and look more impressive, which is important since we eat with our eyes first. I do the same thing with Chocolate Chip Cookies or any cookies, always placing a few bonus chips or goodies (raisins, candy bar pieces, etc) right on the top for the wow factor. 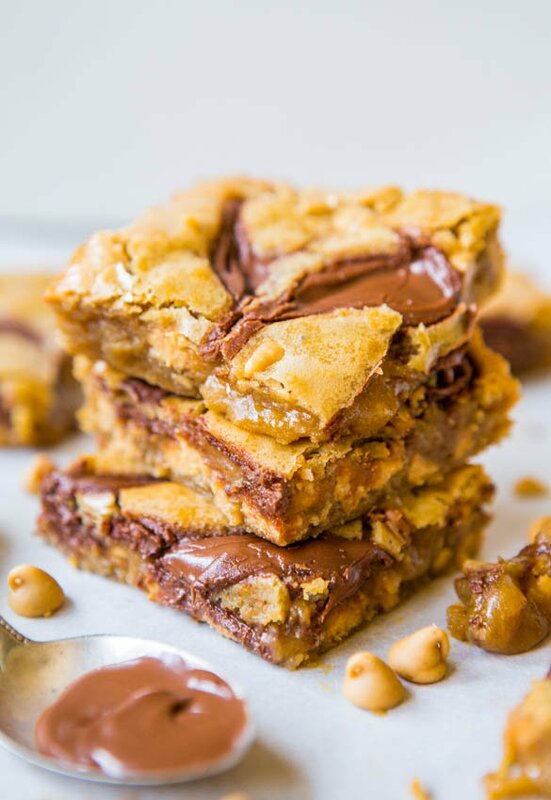 The blondies are super soft, dense, flat, and moist. I don’t add chemical leaveners such as baking power or soda to my blondies because I like ‘fudgy’ blondies. It’s also why I never add leaveners to my brownies. 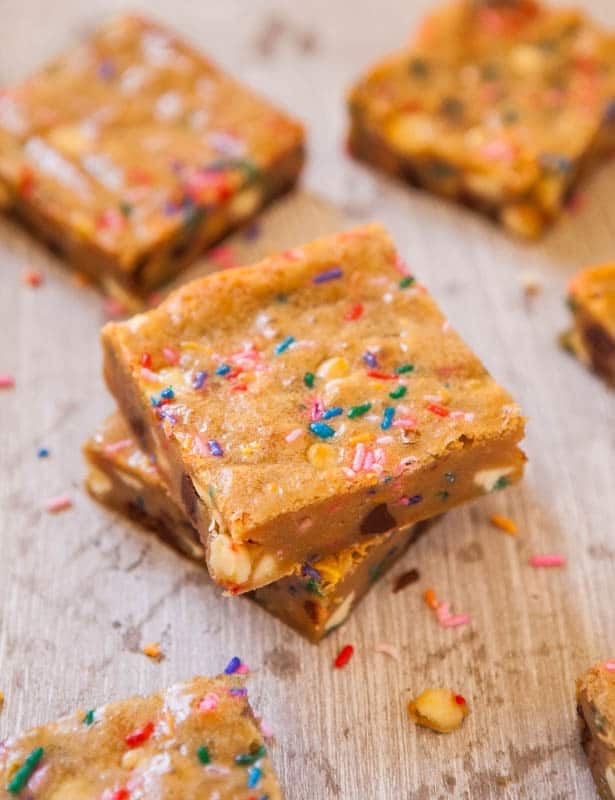 It makes them cakier and while I love cake, I don’t prefer that texture in my blondies or brownies. While baking, the brown sugar caramelizes with the butter, and you’re left with caramel undertones amidst the buttery, rich dough. 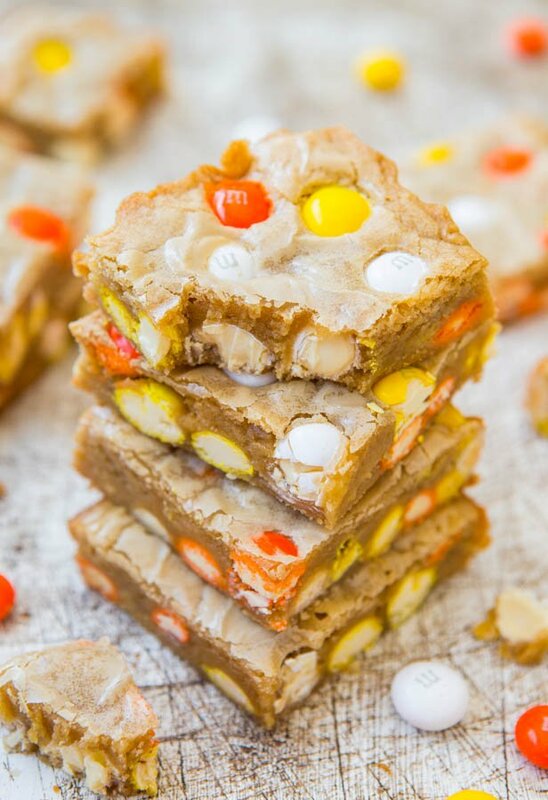 The big white chocolate M&Ms are the perfect complement to the buttery base. 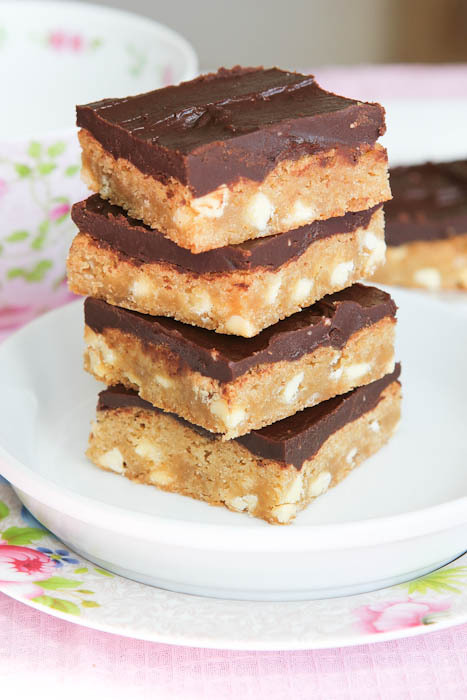 I love white chocolate blondies, and have two other recipes for them. Another one surely can’t hurt. Save this recipe for all your unused Halloween (or Easter or birthday party) candy. Chop it up and bake it in. Extra candy makes everything taste better. 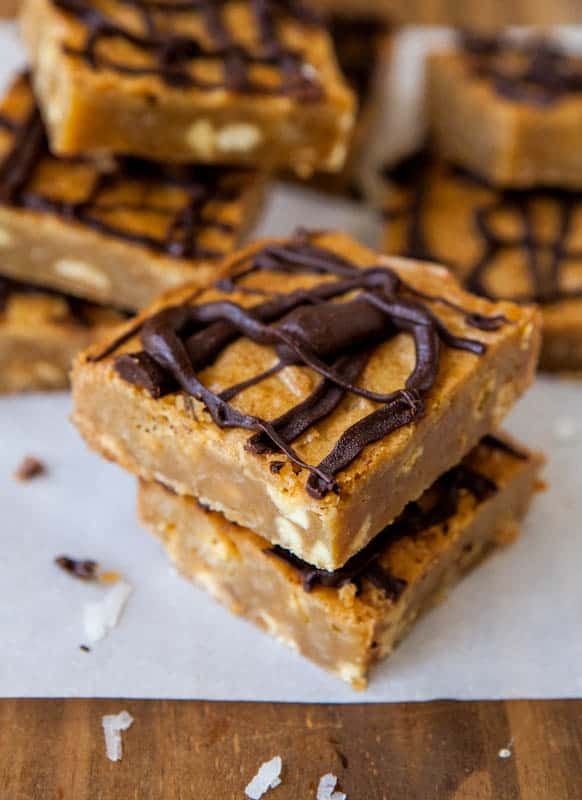 The blondies are super soft, moist, and so fast and easy to make. The batter comes together in one bowl, in 5 minutes, without using a mixer. 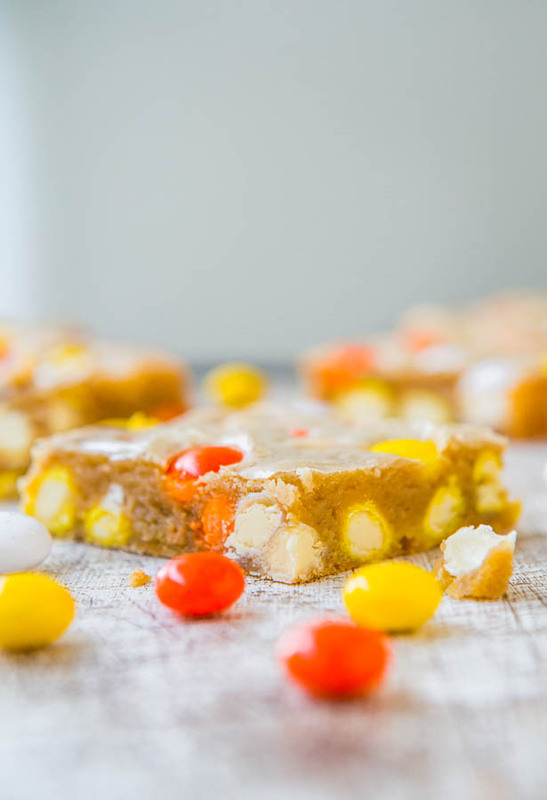 Candy Corn White Chocolate M&Ms are woven throughout the blondies, providing bursts of white chocolate, amidst the buttery, caramely dough. Ready in under 30 minutes from start to finish, and flexible based on what you have. Substitute white chocolate chips, regular M&Ms, or another favorite candy for the M&Ms I used if you don’t have them. 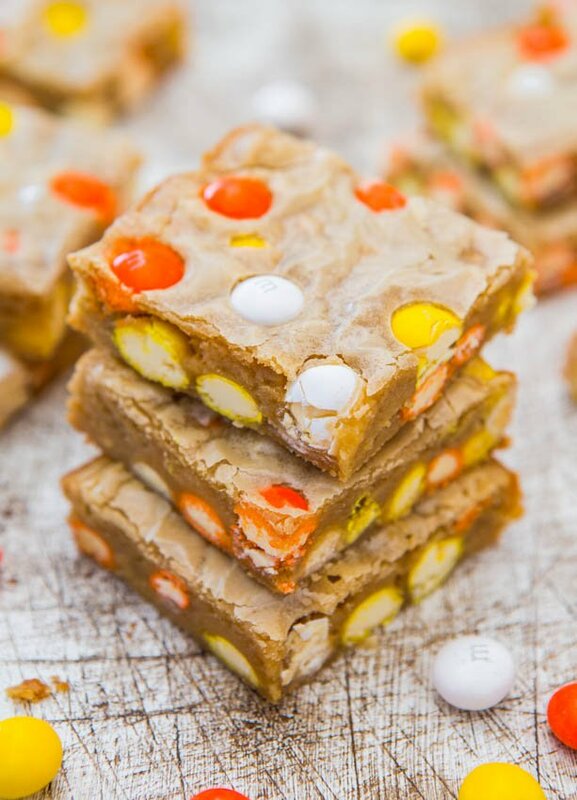 Save this recipe for your extra Halloween or Easter candy. Chop it up and bake it right in. Add remaining M&Ms to top of batter, dispersing them evenly, and pressing them down lightly with your finger. 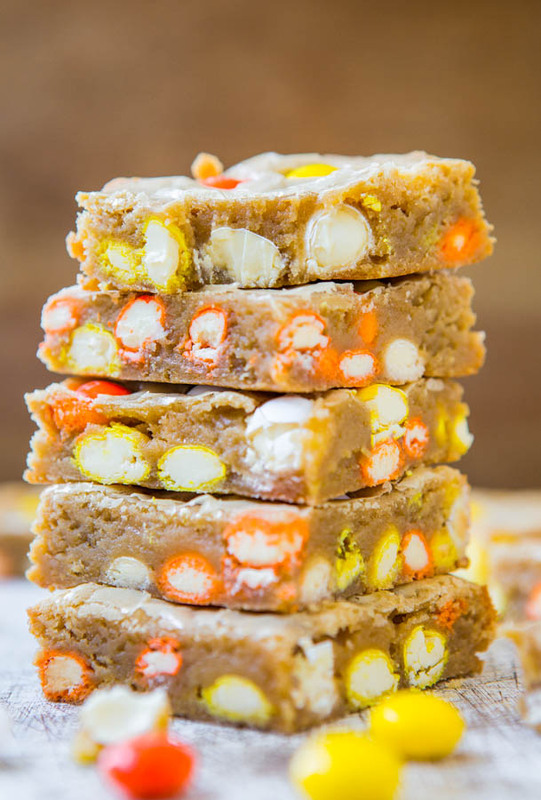 Have you tried the Candy Corn White Chocolate M&Ms? Girl it’s the easiest recipe ever. Everything is “one” and the batter literally takes 5 mins to stir together. I relay and parlay this batter ALL the time! These look amazing!! Can’t wait to try them! I love all blondies! Thanks, Jamielyn! 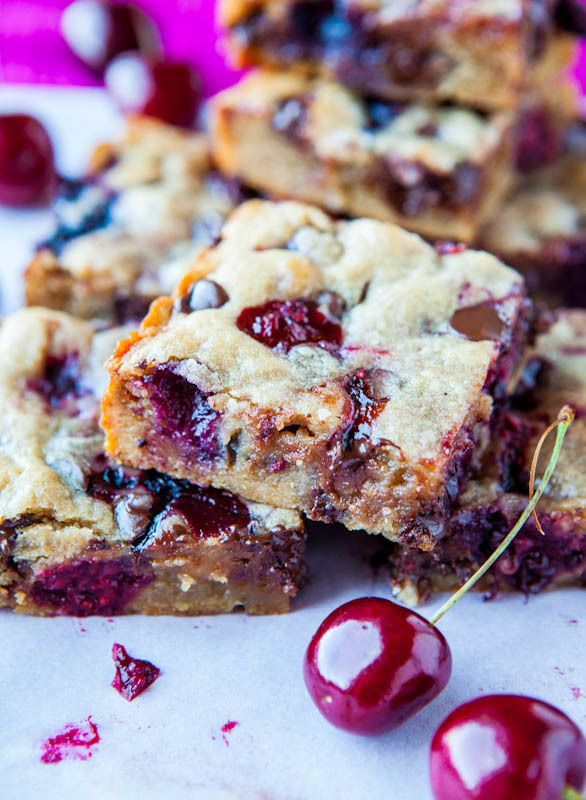 These are the easiest blondies ever! 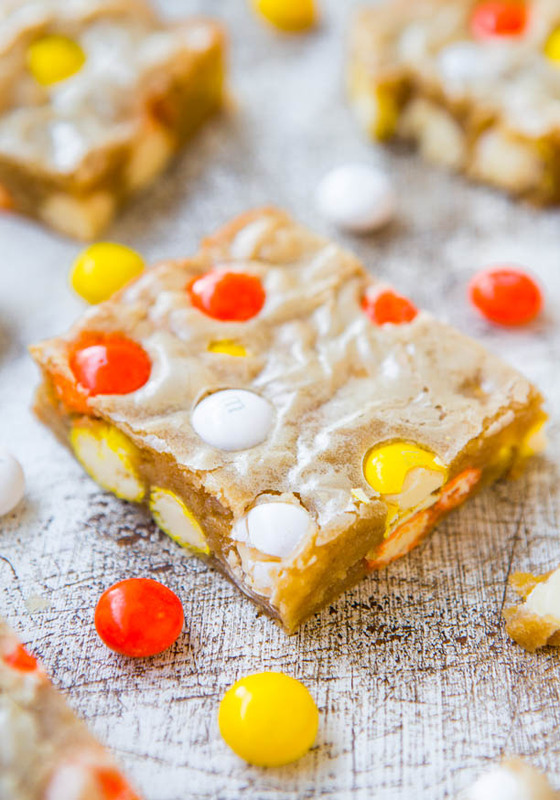 Just made these because we had some of candy corn m&m’s on hand. My husband brought them home by mistake instead of milk chocolate m&m’s. We weren’t fans of them and figured this would be the best way tokeep them from going to waste! I am sad to say I WAY under baked them because I didn’t fully read your last step. Whoops! I baked for 25 minutes but that wasn’t long enough in my oven. I didn’t toothpick test them which i should have. But I have another bag so I will try again. The edges were yummy though! You could probably put them back in the oven for 5 mins if you just made them and they’re still in the pan, semi-intact. I mean, they won’t be super pretty :) but they’re salvageable. Yes, bake until done. Always. Ovens and personal preferences vary – you just have to try your gut, always, and bake until done, whatever that is in your world :) Glad you will try again! OMG. These look amazing!! 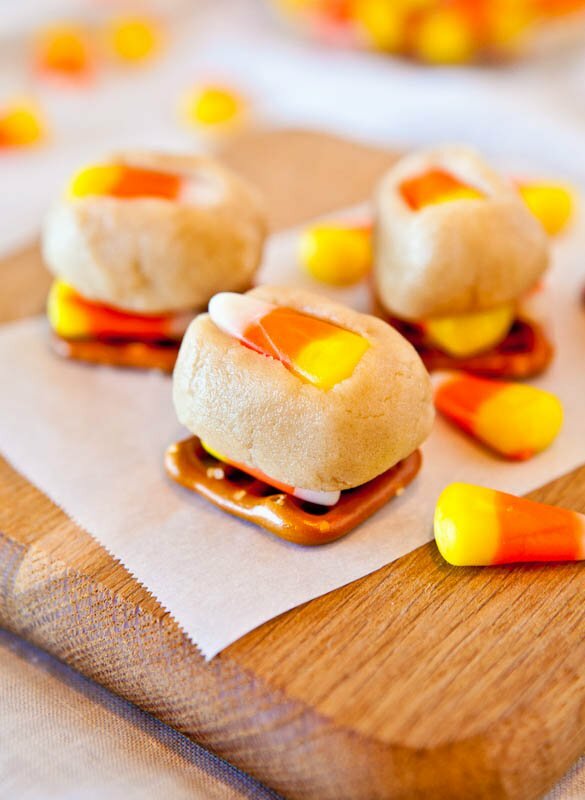 Candy corn is my favorite candy of all time so I’ve REALLY got to get baking! I decided since I have two 8×8 pans I could make these and the fluffernutter bars from your cookbook. No more wavering (and yes–you do your job very well)!! Both taste AMAZING and won’t last long at the party tomorrow! 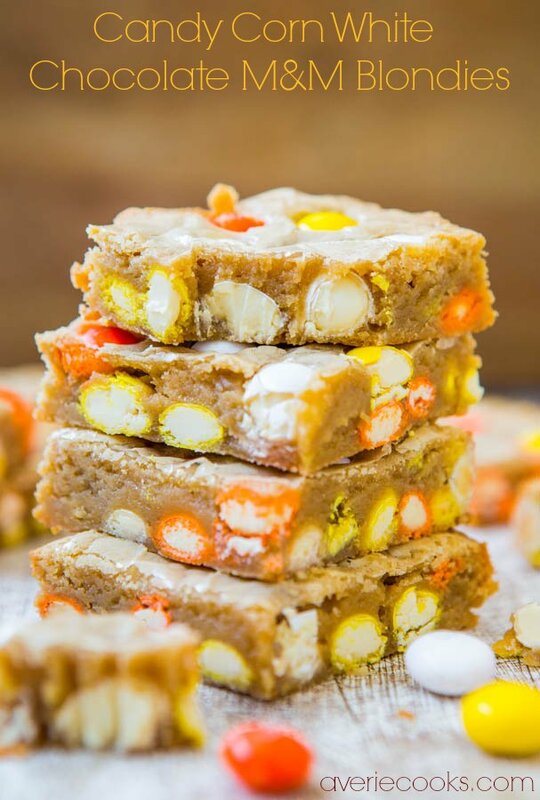 I know I like blondies much better without baking powder–this is a great basic for lots of add-ins and I like the candy corn/white choc M&M’s. 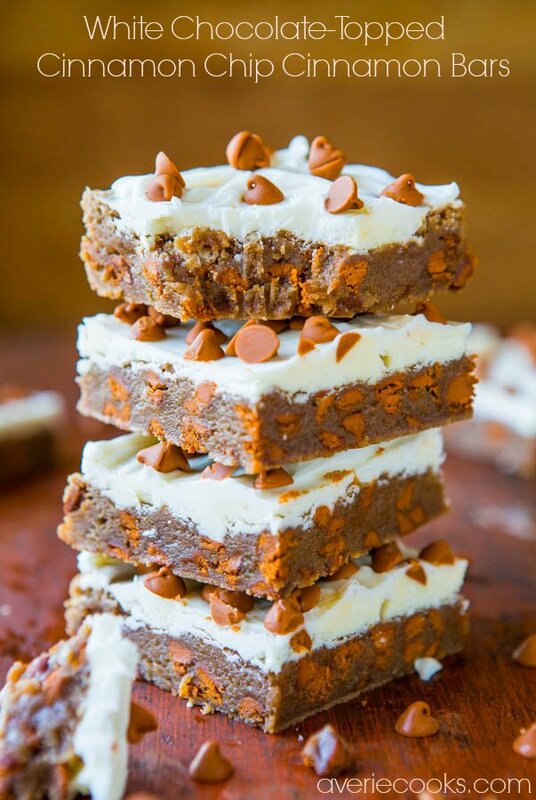 The fluffernutter bars–wow!! My marshmallows became a little stringy (yours look so perfect in the photos) but I figure it adds some extra gooey goodness. As always, I am impressed with your recipes and had fun in the kitchen tonight. I guess while others are out hitting the bars on a Friday night, I’d rather be home making them! Your last line about making bars rather than hitting them – classic :) 99% of the time I am at home on a Friday night (and every other night) cooking and testing and writing! Glad you love both the blondies and the FN Bars! And yes baking powder in blondies makes them so airy and cakey – not a fan. I have trashed up this basic “one” recipe so many ways – it can do me no wrong. Have extra stale Xmas cookies, random candy, half cup of pretzels at bottom of bag, put it in. Always works! The FN Bars and the marshmallows…If you over-work/over-stir MMs at all, they start to break down and get stringy. But it’s one of those things that no one will ever notice and they taste as good or better that way anyway! Thrilled that you’re thrilled with the recipes. As always, the detailed field reports are worth their weight in gold for me! Thank you! 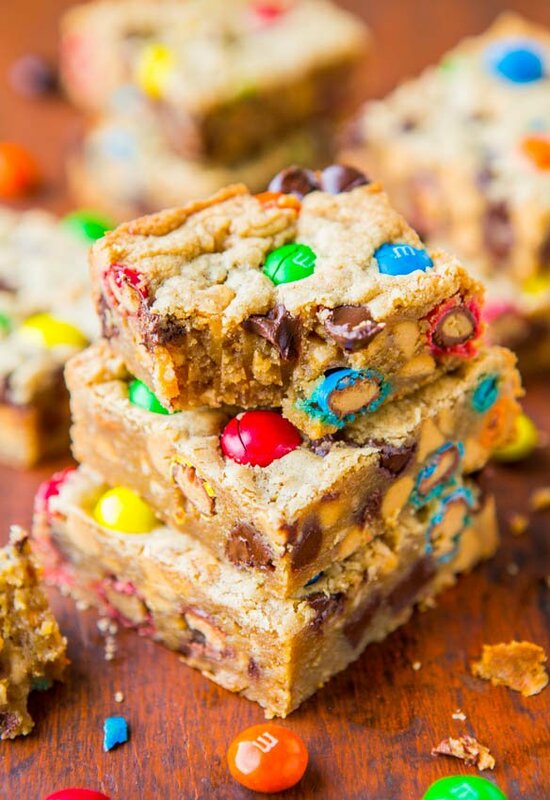 I’ve never tried those M&Ms but they add such a fun and festive touch to your blondies! Neither have I! I don’t think they have them in Canada where I’m from! 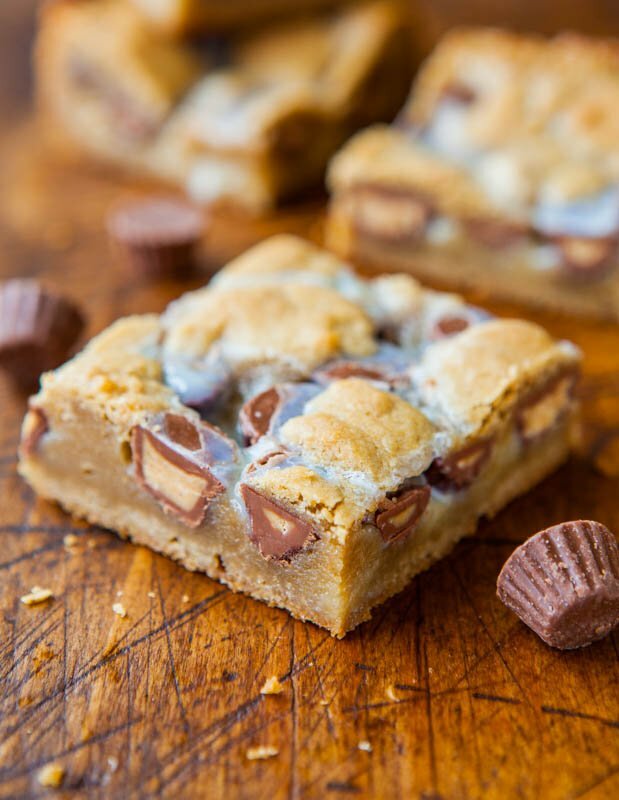 You’ve definitely got the “fudgy-gooey” factor covered with these. Man do I love under-baked blondies! I love how festive these are!! 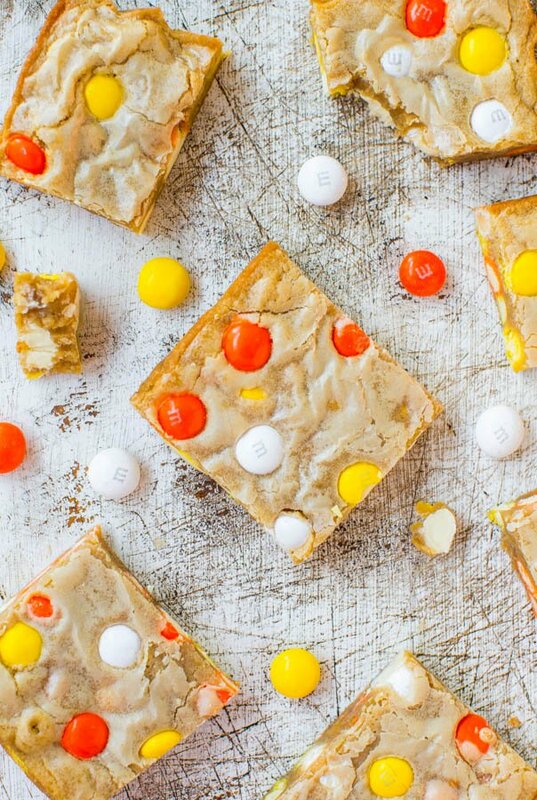 I think this is the perfect use for those candy corn m&ms. Yum! These are perfect for Halloween!! Candy corn and m&m’s, oh goodness I am loving this!!! In terms of salvaging them…just make a thin frosting out of 1/4 c butter or cream cheese, powdered sugar about 1 -2 cups, add a splash of milk to get the right consistency. Thank you so much for responding! :) Yes, I followed your directions exactly. My pan is a metal, non-stick 8×8 square baking pan from BB&B. I covered it with foil and sprayed the foil. 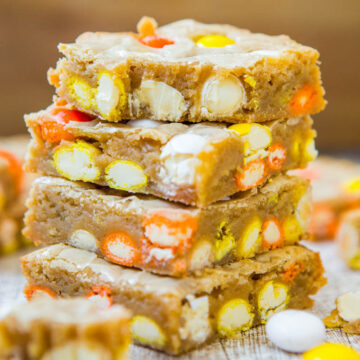 I used the candy corn white chocolate M&M’s and mixed them in at the very last second and was very very gentle in mixing them in. Poured them straight into the pan and gently leveled it all out. Placed the remaining M&M’s on top and just lightly pressed them down, evenly distributed. It must must be my oven?! I will have to temp the oven with a thermometer and find out how off it is….. Good thing my new oven is already ordered and on its way! 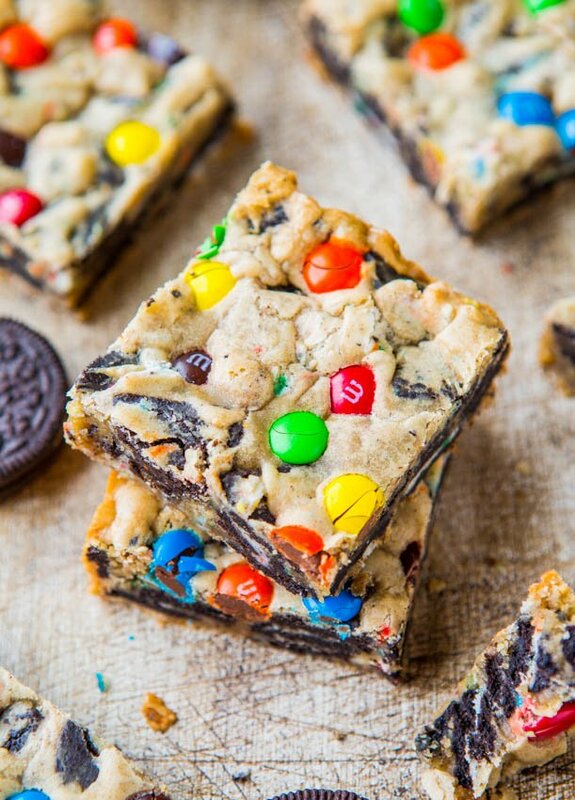 :) I have baked a bunch of your recipes with regular, peanut, and pretzel M&M’s and never once had a problem. So strange!! Thanks for the salvage tip! 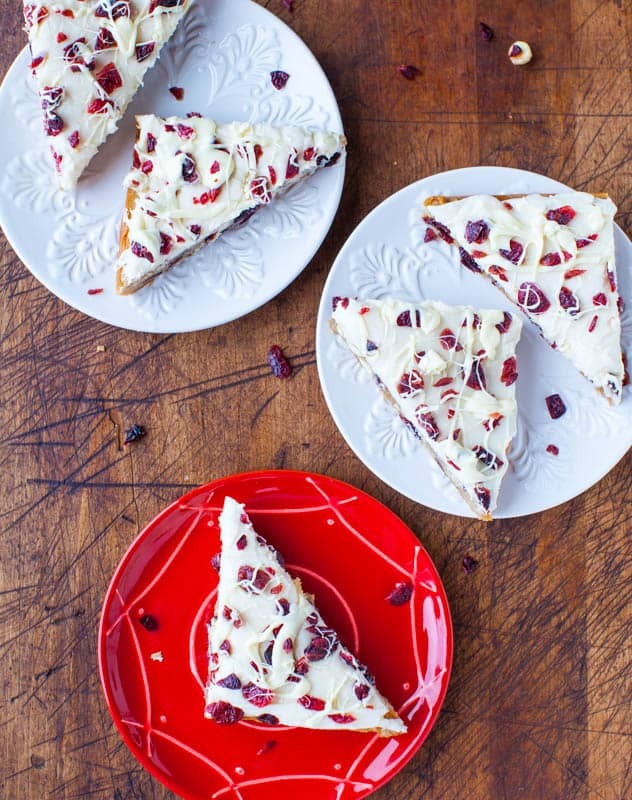 I was considering dipping the tops in melted white chocolate, but love your frosting idea! Thanks Averie!!! And oven thermometer – yeah could be a hot oven but if you’re baking other stuff without issue, that may not be the problem. Glad you’re getting a new oven though – wow how cool! And yes, frost those puppies and you’ll be fine. And you can even add some sprinkles if you have any…will cover up ANY flaws :) I do it all the time! Would it be ok to put candy corn in batter? They will bake right? These are missing salt–they just need a touch, and you notice it when you’re eating them. Theyre a bit too sweet with nothing to counterbalance that sweetness and give them complexity. Salt in desserts is a personal preference so always salt to taste and everyone’s tastes vary widely on that so do as you think is best. Thanks for trying the recipe.